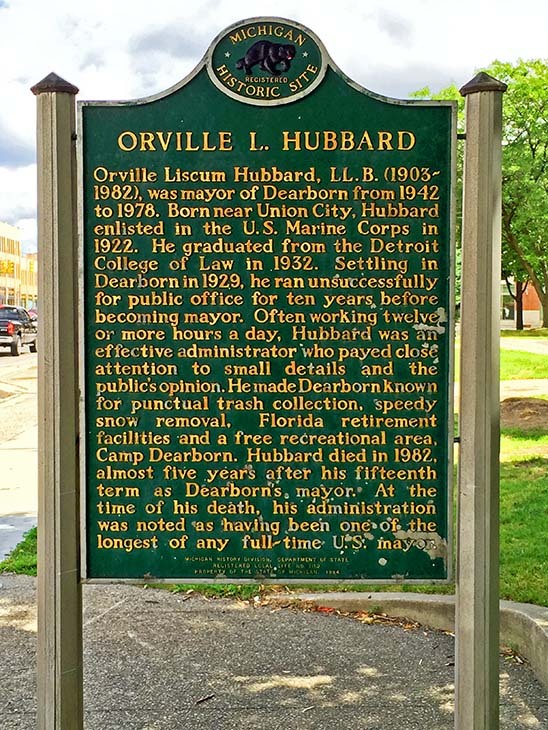 Orville Hubbard served as mayor of Dearborn from January 1, 1942 to January 1, 1973 and became a nationally known figure. This suburb hadand still hasan exceptionally strong tax base—the headquarters of the Ford Motor Company; their recently expanded huge River Rogue production plant; their proving grounds and many of their technology centers. In addition, two major museums are located in Dearborn: the Henry Ford Museum and Greenfield Village. The suburb includes one of the area's most popular upscale malls, Fairlane Town Center, along with massive hotel and convention facilities. Since Henry Ford began producing boats for the Navy in 1917, Dearborn has been one of the nation's most prosperous municipalities. Mayor Hubbard provided his citizens with excellent city services, perhaps services unrivaled in the nation. Stories were often repeated about there never being snow on the streets of Dearborn since city crews removed it as rapidly as it fell. Indeed, spending tax revenue was a major challenge for Mayor Hubbard. His funds were so flush that the city bought land and built a large park for residents some 40 miles west of the suburb. And then Mayor Hubbard used tax funds to build a retirement development in Florida for Dearborn residents. 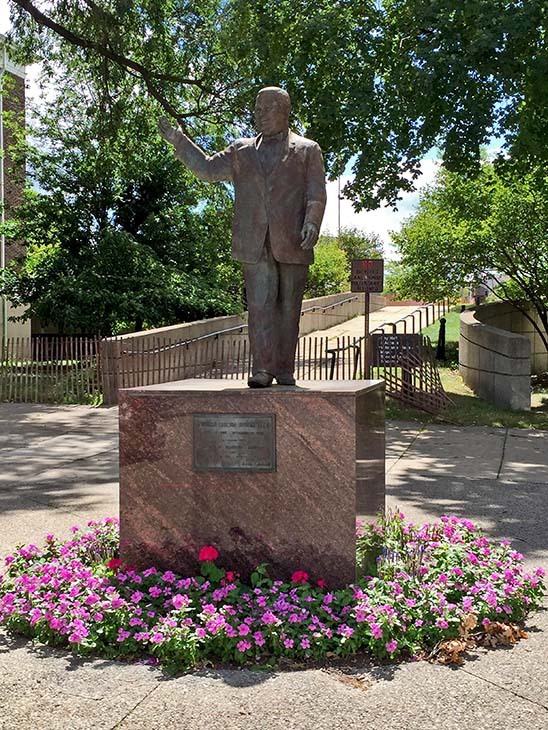 Mayor Hubbard, however, was best known nationally for symbolizing suburban white resistance to black residents in the post-World War II years. Although trained as a lawyer, he was a flamboyant and rather unsophisticated politician. Apparently, he felt that many residents of Dearborn's numerous prosperous neighborhood would prefer a more erudite and polished leader. Presumably, he knew that his strong opposition to African Americans would secure him the votes of both his highly-educated constitutients as well as the working-class population living in the east side neighborhoods. Dearborn's factories employed thousands, perhaps tens of thousands, of black workers. To relieve the terrible housing crisis that faced defense workers in World War II, federal housing agencies proposed building temporary housing in Dearborn and nearby suburbs. Mayor Hubbard strongly opposed this construction since he knew that federal officials would operate Jim Crow housing, but would introduce some blacks to Dearborn. He litigated the matter until the Allies defeated the Germans and Japanese, making the matter moot. Just after World War II, developers, backed by Metropolitan Life, proposed building a huge upscale housing complex with appropriate shopping facilities. Mayor Hubbard successfully opposed this since he thought that the developers would not be sufficiently diligent in keeping blacks out. By this time, a large number of middle-income blacks were working in Dearborn. Throughout the post-War periodand even after enactment of the national Open Housing Law in 1968Mayor Hubbard firmly but politely let it be known that blacks were welcome to work in Dearborn, but were not welcome to live there. Under Mayor Hubbard's reign, Dearborn's population grew from 64,000 in 1940 to 104,000 in 1970. In the late 1980s, Dearborn became a major port of entry for Arabs migrating to the United States. Census 2000 reported that one-quarter of Dearborn's 98,000 residents were born outside the United States, largely from Middle Eastern countries. Forty percent of the immigrants were born in Lebanon and 10 percent in Iraq. In 2000, there were 1,200 black residents of Dearborn. In recent years, officias in Dearborn have tried to indicate that Mayor Hubbard's racial policies are no longer in effect, but the Dearborn's reputation for hostility toward African Americans remains alive among Detroit's blacks. Book: Orvie: The Dictator of Dearborn by David L. Good. Detroit: Wayne State University Press, 1989. Michigan Historical Marker. This is clearly visible on Michigan Avenue in Dearborn very near the suburb's city hall and the modest statue of Mayor Hubbard.